First, a primer on the Hyatt Diamond Challenge. In 2015 Hyatt changed the rules to the Challenge slightly. In the past you received immediate Diamond status during the trial period. For the Elite Tier Offer, you are not given status during the challenge period. To get status, within 60 days of enrolling you have to stay 6 nights at a Hyatt property (Mlife doesn’t count) to earn Platinum status or 12 nights to earn Diamond status through February 2016. Since Platinum is basically worthless and can be attained with the Hyatt Visa credit card, the challenge is only worth it if you get all 12 nights. In addition, you receive a bonus of 1,000 points for reach of your first 6 nights. Any eligible paid nights count, including Points + Cash stays. With the current 20% points back promo if you have a Hyatt Visa card, this makes point stays even more enticing. If you live somewhere with a Category 1 property and no nights already reserved, you could do the entire 12 night challenge for 12,750 points and $600. How did I get to this number? One night at a Category 1 property is 2,500 points plus $50*. With the current promotion, you get 20% of your points back, so each night is essentially 2,000 points. *Note: Taxes in your area may vary, so I am not adding taxes in to the cost or the extra points you would earn for paying the tax with your Visa. In addition, you will receive 5 points for every dollar spent and a 15% tier bonus as a Platinum member. 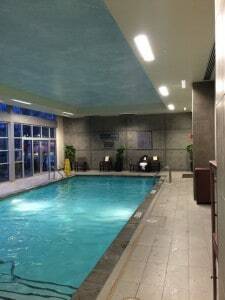 Plus, you will be using your Hyatt Visa card that will earn you 3 additional points per dollar. So you will earn 437.5 points per night, bringing the “cost” down to 1,562.5 points per night. The total cost for 12 nights would be 18,750 points + $600. But remember, you earn 1,000 points for the first 6 nights, so the true cost of Diamond Status is 12,750 points + $600. If you received the “Stay More, Play More” promotion, that would lower your “cost” even more. For example, my offer of 30,000 bonus points after 15 nights would require me to mattress run 3 additional night for a total cost of 17,437.5 points + $750. However, after those 15 nights I would get my 30,000 bonus so the whole thing would cost me $750 cash but I my net gain would be over 12,500 points and Diamond status for a year. Many people pay $400+ for airport lounge access for a year; so $750 for Diamond status (which in my opinion is more valuable than lounge access) plus 12,500 points is not totally obscene. This is my scenario and probably a lot more realistic for most people. I already have a number of stays planned over the next 60 days but will need to add some nights to hit my 12 nights. Some of you probably will have no problems hitting 12 nights in 60 days if you travel for work or have a planned vacation — good on you! I am not so lucky. I don’t count the cost of these stays since they were already booked. So I would need an additional 5 nights to get my Diamond Status. 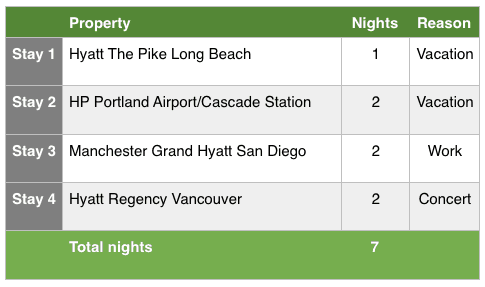 In Seattle (where I live), there are 6 Hyatt properties — the lowest being a Category 2 and highest being a Category 5. Prices during the 60 days ranged from $99 to $249+. The absolute cheapest way to get my 5 nights would be through Points + Cash at the Category 2 property — 4,000 points plus $55 per night. 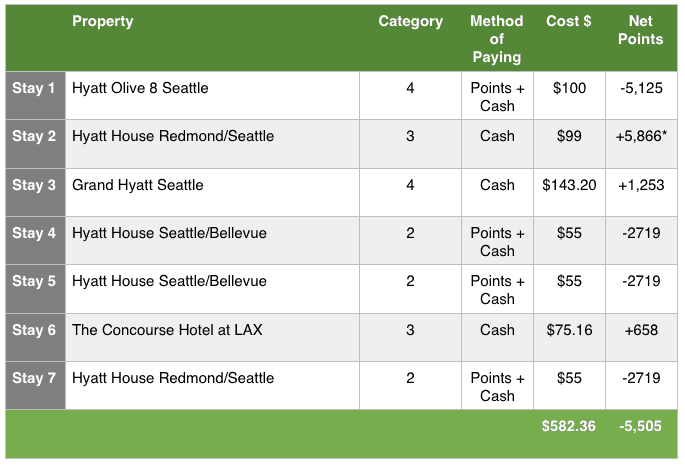 However, with the 20% points back and earned points, it would essentially be 2,718.75 points plus $55 per night for a total of about 13,500 points and $275. However, for the first 6 nights I would receive 1,000 bonus points, so essentially 7,500 points and $275. However, I wanted to finish my challenge by April 30 so that I could also get my “Stay More, Play More” offer of a 30,000 bonus points after 15 nights (I already had 3 nights at an Mlife property, which counts towards the Stay More, Play More). With that in mind, my final stay in Vancouver wouldn’t count since it was in May. So I would need 7 (!) total additional nights. However, 30,000 points with two extra nights was worth it for me. Now, I could have done all 7 nights for 13,000 points and $385, netting me Diamond status and 17,000 points. 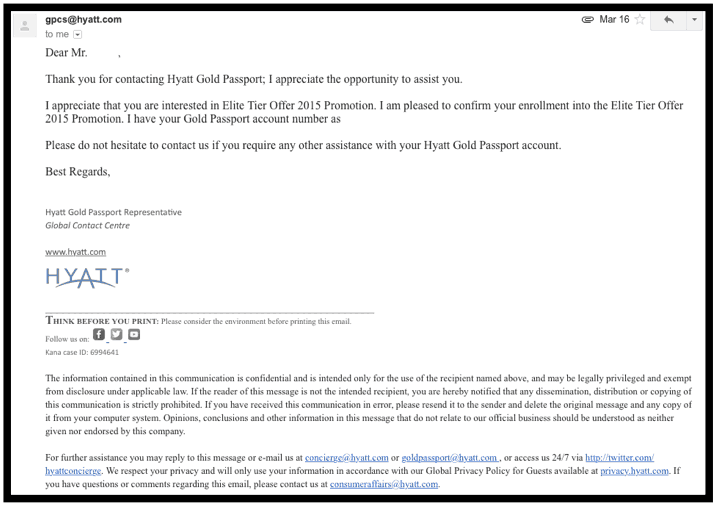 If you value Hyatt points at 1.5 cents per point, I would be paying $130 for Diamond status. I decided to be a bit more creative and try out some of the additional properties in Seattle so my total cost ended up being higher. I also did some cash only stays when I found a deal. In hindsight I don’t know if I went the cheapest route but that is part of the process of figuring this out. So here is how I actually attained my Diamond status and my 30,000 Stay More, Play More bonus. I spread my nights out so that each stay was only 1 night; I figured this would help me to earn my Diamond status for 2016 through completing 25 stays. 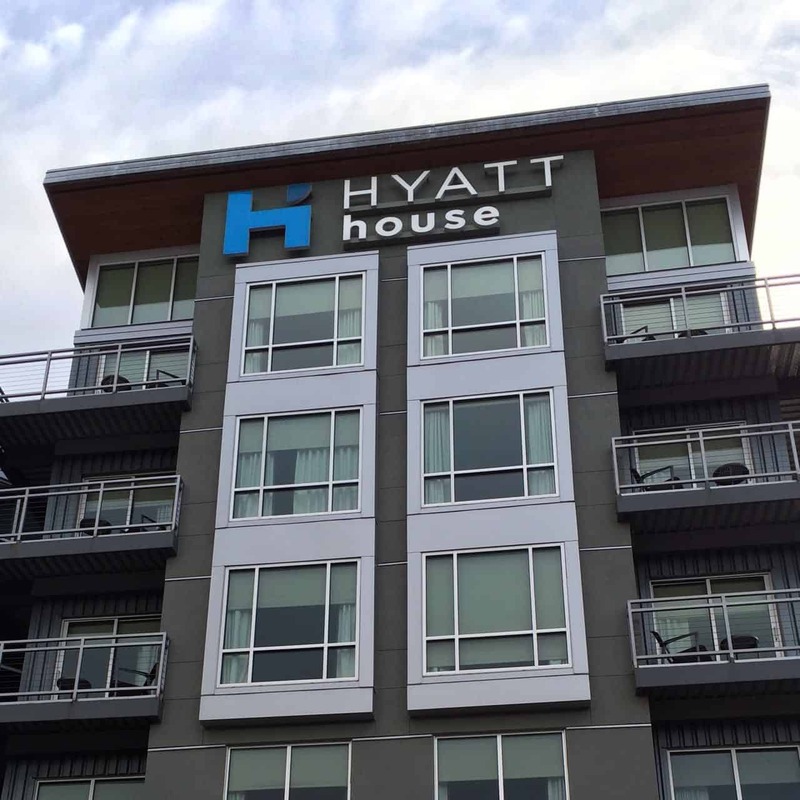 *Note: For the stay at the Hyatt House Redmond/Seattle I was given a 5,000 point bonus because there was construction outside my room all night. The 7 nights I needed cost me $582.36 and 5,505 points. However, I received a bonus of 1,000 points for the first 6 nights AND the 30,000 point bonus for reaching my Stay More, Play More offer. Tip: Make use of the Hyatt Best Rate Guarantee to lower your per night costs for cash stays, like I did for The Concourse Hotel at LAX. So the cost of the Hyatt Diamond Challenge for me ended up being $582.36 and a net gain of 30,495 points. If you value points at 1.5 cents a point, then Diamond status cost me about $125. With 12 additional nights already reserved in 2015 where I will be able to use my Diamond status, the cost of the Hyatt Diamond Challenge was definitely worth it for me.